Left Coast Cellars of Willamette Valley, Oregon was founded in 2003. With 350 acres of land and 130 acres of vineyards, they use sustainable viticulture to produce only estate-grown wine. 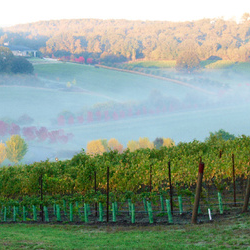 They're LIVE Certified Sustainable, Salmon Safe Certified, and are one of fourteen wineries to complete the Oregon Environmental Council's Carbon Reduction Challenge. All of the power for the guest cottages, the front gate, and the vineyard irrigation is run by solar power, and use a big chunk of their land for their Oak Savanna Restoration Project. They are very environmentally conscious. This is also the fifth wine that I've reviewed by them. You can check them all out by clicking here. You'll see that the 45th parallel is often brought up on wine labels from both Oregon and France. That's because many of the great vineyards in France are along or near this latitude, given just the right coolness and daylight for great wines of specific varieties, and the vineyards in Oregon around this latitude are turning out to be great as well. Left Coast's Latitude 45° Vineyard is directly on the 45th parallel on a south facing slope, and it's the first block you see when entering the gates on Left Coast's estate property. It's 272 feet above sea level, spans 10.4 acres, and was planted in 2001 with Pinot Noir clones Dijon 777, 667, and 114. 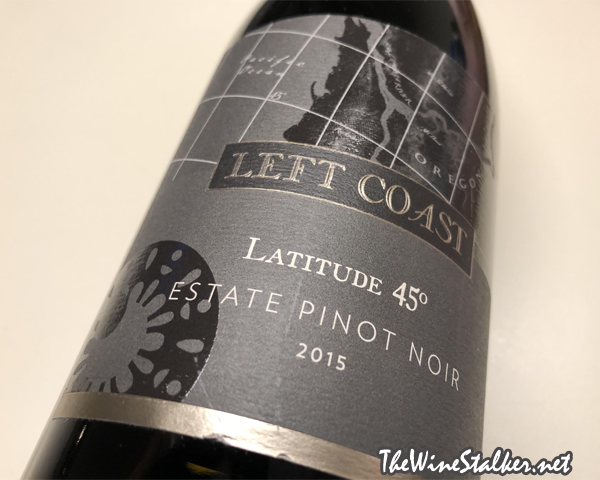 The 2015 Latitude 45° Estate Pinot Noir is 100% Pinot Noir fermented in French oak barrels and aged for eighteen months in 75% new French oak and 25% neutral French oak. 1405 cases were made and it has a final ABV of 13.8%. Before I start tasting this wine, I have a little announcement. I initially put this out there in my last article (Wine bloggers share their favorite posts) but I'm going to repeat it here: a few things have a occurred in my life that may greatly effect this blog. For one thing, an unexpected expense has forced me to seek a second job. This will take time away from my family, which hurts me much more than it taking time away from this blog. I'm taking February off from new content like last year (with the exception of my Wine Pick of the Month) and will again do Flashback February to feature an old article, review, or meme every day of the month. When I come back in March and April I'll finish up the reviews I promised I would write. By then I should know where the blog stands. Will I continue to write monthly articles? Will I only have time for reviews? Or will I have to retire from blogging? We'll see. I hope that you join me in Flashback February, and I'll see you with new content in March. Wish me luck, guys! Alright, enough of that crap! The color of the wine is ruby red with high to medium clarity. Cherries and black tea are the dominant aromas on the nose, backed up with cinnamon, sandalwood and dried rose petals. On the palate it's medium bodied, ridiculously smooth, with a rather low acidity and rich mouthfeel for what I was expecting. There's flavors of cherries, leather, and freshly sharpened pencils... but the star of the midpalate is the deeeeeep cocoa. It finishes with fine-grained, cedary tannin, some ethanol heat, a thick caramel coating, and flavors of cherries and leather.